A pothole that was cold patched on Garland and Forest. If you have taken a drive just about anywhere in Aroostook County, chances are you have seen them. These are the gaping holes in asphalt or dirt that seem poised to swallow your car in its entirety should you be brave enough to drive over them. Instead, they garner our rage. That rage is understandable, as every time a car hits one, a few choice expletives often tend to follow suit from the driver or passengers. Not everyone shares the animosity, though, as these dastardly demons can be an auto mechanic’s best friend. It makes sense, I guess. Each time someone hits a pothole there is a great chance for a tire to pop, shocks to give way or at the very least, the seasonal road defect could knock the alignment out of whack. Personally, I take these potholes and frost heaves as a challenge. It brings out my inner child, akin to driving a go-kart around a racetrack, zooming in and around the other karts, kind of like playing the Mario video game. This past weekend, while driving through the communities of Island Falls, Oakfield and Smyrna, I realized just how widespread the problems are. Roads that don’t have potholes tend to have frost heaves, many of which could be used as launching pads if you are not careful. I suppose some could take that as a challenge and try to recreate jumps made famous by the General Lee in the “Dukes of Hazzard” show. I’ll admit that the thought has crossed my mind, but the practical side of me always kicks in and reminds me that vehicles are not made to go airborne without dire consequences. 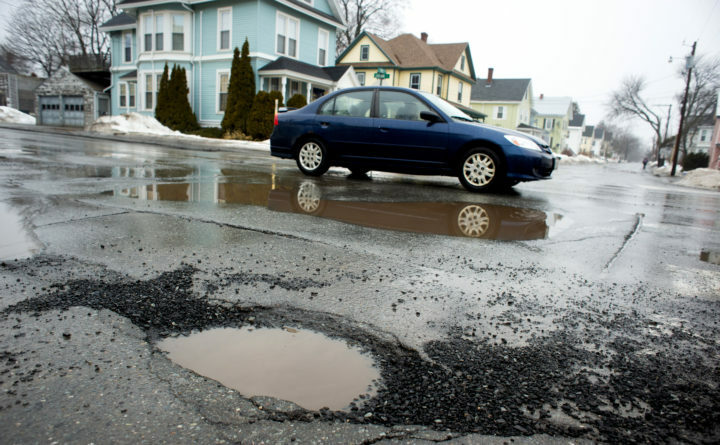 Aroostook County is not alone in its pothole problem. The city of Bangor has reported that craters, cracks and heaves riddle many of its streets. At one point, the Bangor Daily News documented more than 200 of these hazards. Filling these holes with asphalt is now a top priority for many already overworked public works departments in Aroostook County. It’s been a long five months of winter, so it’s understandable that plow crews have stretched themselves to the max and are unable to get to every hole as soon as they open up. Plus, the fill tends to wash out with the next heavy rainstorm or extensive traffic. Patience is the key. If you see a really dangerous hole, notify your local public works department, town office or board of selectmen and chances are they will take care of it in a day or two. And have faith, warmer weather is coming. Eventually.